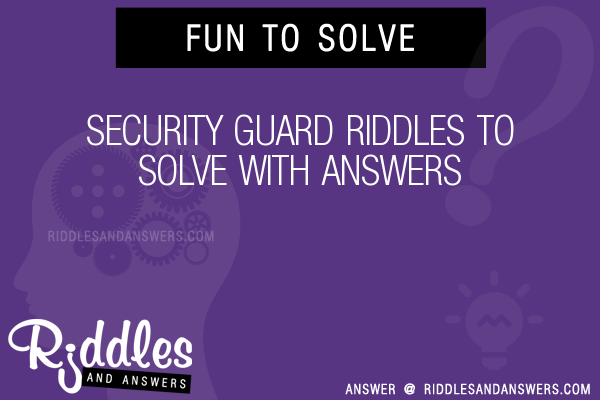 Here we've provide a compiled a list of the best security guard puzzles and riddles to solve we could find. The results compiled are acquired by taking your search "security guard" and breaking it down to search through our database for relevant content. Guardian of the dark am I, though sometimes I take to the sky and look below for a tasty meal. My armor is harder than the toughest steel. My breath is often made of fire. You do not want to provoke my ire. I've a fondness for gold and shiny things, I am a foe of knights, and slayer of kings. What am I? A lawyer argued for $1,000,000 damages based on the following claim: His client went to an art museum, where he saw a painting of Marie Antoinette on a guillotine. He fell asleep and dreamed of the painting. At the museums closing time, a guard tapped him on the neck just as he dreamed of the guillotine beheading Marie Antoinette. The tap provoked immediate cardiac arrest and a fatal heart attack immediately following, because he associated the tap with the guillotine blade. The judge dismissed the case. Why? If the client died in his sleep, there would be no way of knowing what he was dreaming. A man in prison has a visitor. Afterward a guard asks the inmate who the visitor was to him. The inmate replies: "brothers and sisters I have none, but that man's father is my father's son." Who was the visitor to the inmate? You die then you find yourself in limbo, and you see two doors. One of them leads you to hell and the other one heaven. They are being guarded by two guardians. The guardian guarding the doorway to heaven always tells the truth and the guardian guarding the doorway to hell always lies. What is the one question you will ask to either of the guardians to find out which door will lead you to heaven? If I asked the other guardian which door leads to heaven, what would he tell me? The woman started walking across the bridge when the guard was inside the hut. She walked all the time he was inside (5 minutes) and then turned and moved back towards the kingdom. On approaching the kingdom he was asked for papers and since she did not have any, she was sent back.